The VIP project developed a strategy to identify VIPs who are at high risk of re-presenting to hospital and implemented methods to address their medical and psycho-social needs. This new model of care has reduced the need for hospital-based care by using interagency partners in the primary care sector to provide support for VIPs in the community. 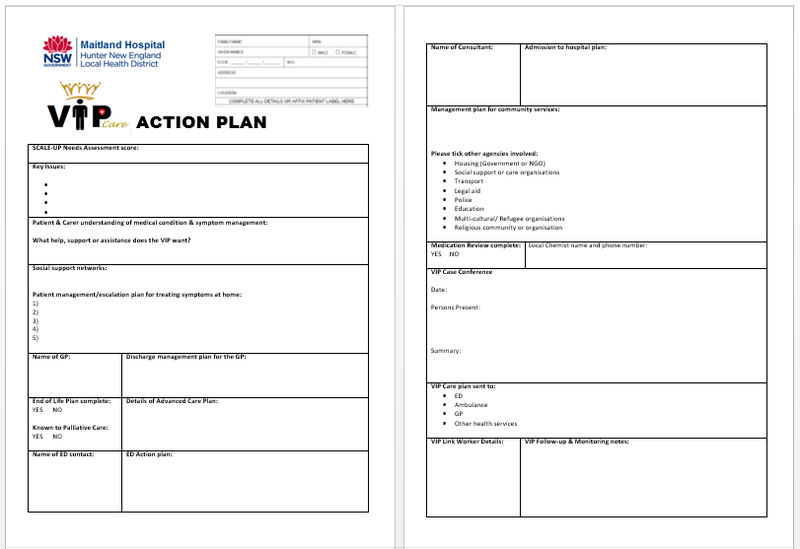 To identify people at risk of recurrent re-presentations to emergency departments (EDs) and unplanned readmissions to hospital, with the aim of improving their quality of life and healthcare experience and addressing their medical and social needs. Improves the patient journey and experience. Provides personalised care plans that meets the patient’s identified needs. Focuses on wellbeing and health to improve quality of life. Improves social networks and links to the community. Reduces staff frustrations and VIP fatigue by empowering staff to implement changes that impact VIP care. Changes hospital culture by decreasing negative labelling and encouraging compassionate care for VIPs. Fosters healthy working relationships between multidisciplinary teams in the acute and primary care settings. Reduces presentations to emergency departments, improves emergency performance time, reduces overcrowding, decreases length of stay and improves access to urgent care. Reduces unplanned readmissions, resulting in improved efficiency, cost-effectiveness and increased accessibility of resources. Potentially reduces acute healthcare costs and improves hospital performance. Preventing re-presentations to EDs and readmissions to hospital are a priority for NSW Health, as they continue to rise by 3-6% per year. This results in reduced resource availability to the community and increased cost to the health service. VIPs present a significant challenge for clinicians, who often struggle to meet the needs of these vulnerable patients. As a result, these patients may have a poor patient experience and worse health outcomes. An audit of the top VIPs revealed two distinct communities, each with key social determinants impacting their reasons for return. VIPs re-presenting to ED had an average age of 40 years with high prevalence of mental health issues, living alone, Aboriginal status and homelessness. VIPs readmitted to hospital had an average age of 61 years with high levels of mortality within 12 months, multiple co-morbidities, and generally lived with a partner. In total the three sites identified 334 VIPs who cost HNELHD approximately $3.1 million in 2014. Both groups identified similar issues with the current system, including reduced access to services, poor continuity of care, lack of communication between primary and acute services, disempowerment of patients and staff, and high levels of social disadvantage. 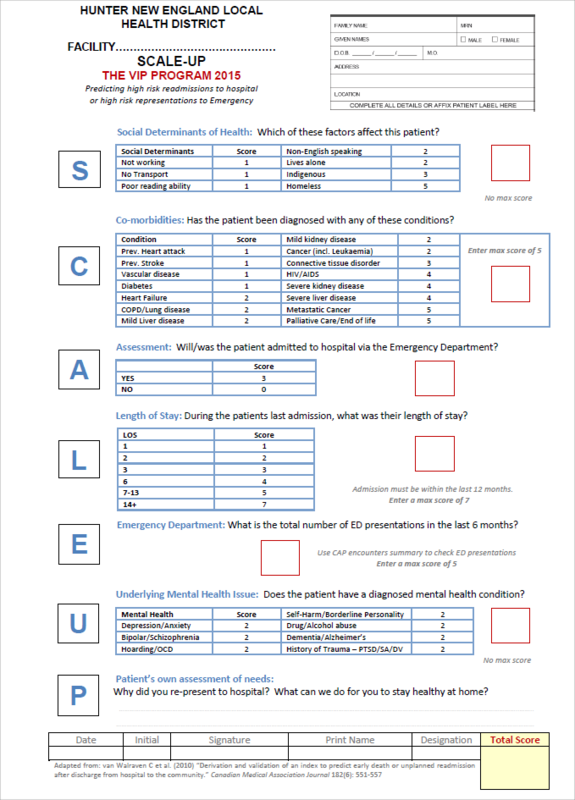 Case by Case: Identification of VIPs using the Electronic Patient Journey Board and assessment of the social determinants using the SCALE-UP tool. Coordination: Individual case management with a VIP care coordinator and development of personalised care plans that connect VIPs to the community. Campaign: Education to patients and staff on local after-hours services, and improving health literacy in patient escalation plans and symptom management. Compassionate Care: Changing the negative culture within the hospital towards VIPs by using positive language and a positive feedback cycle with staff. 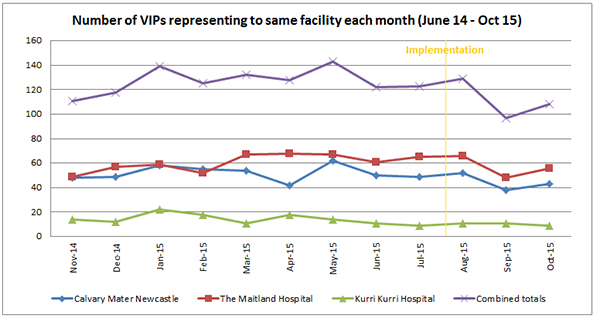 There was a combined decrease of 44% in VIP readmissions to hospital, with Calvary Mater achieving a 47% decrease and Maitland and Kurri Kurri achieving a 56% decrease. 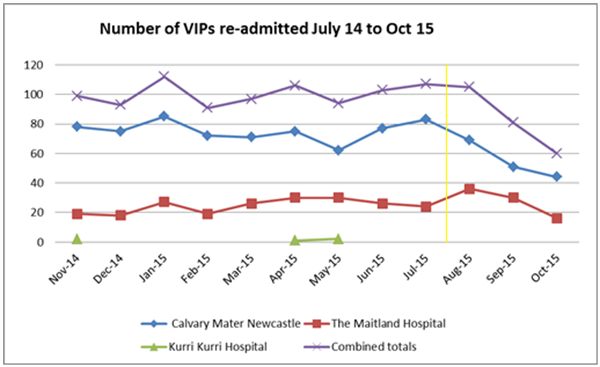 There was a combined decrease of 17% in VIP presentations to the ED, with Calvary Mater achieving a 17% decrease, Maitland achieving a 16% decrease and Kurri Kurri achieving a 19% decrease. There is now more accurate identification and assessment of vulnerable, high needs patients through the use of the SCALE-UP tool. The introduction of personalised care plans (VIP Action Plan) now addresses psycho-social vulnerabilities and focuses on improving quality of life. There has been a reduction in negative labelling of VIPs, by reducing staff fatigue and frustration. There has been improved communication and integration, through interagency partnerships across primary, secondary and tertiary care. There are now clear and consistent discharge processes, follow-up and information exchange for VIPs. Make sure ED clinicians ask the patient what they want and need in terms of care. Personalise VIP care plans to suit the patient, their carer and family. Focus on the quality of life and well-being of the patient. Develop a social support network that links patients to the community. Early planning for transition in and out of hospital is important. Link with pre-existing community services and non-government agencies. Build sustainability by ensuring a committed executive team and acknowledging the care needs of VIPs in the organisation’s strategic plan. Remember that this is NOT a quick fix solution, but can lead to dramatic improvements in care over time. Boston University Medical Center. Project Re-Engineered Discharge (RED). Agency for Healthcare Research and Quality; 2010. Boutwell A, Rutherford P. Summary: STate Action on Avoidable Rehospitalizations (STAAR) Initiative. USA: Institute for Healthcare Improvement; 2009. Calvillo-King L et al. Impact of social factors on risk of readmission or mortality in pneumonia and heart failure: systematic review. Journal of General Internal Medicine 2013; 28(2): 269-282. Chan FWK et al. Risk factors of hospitalization and readmission of patients with COPD in Hong Kong population: analysis of hospital admission records. BMC Health Services Research 2011; 11: 6. Coventry PA, Gemmell I, Todd CJ. Psychosocial risk factors for hospital readmission in COPD patients on early discharge services: a cohort study. BMC Pulmonary Medicine 2011; 11(1): 49-58. Hu J et al. Socioeconomic status and readmissions: evidence from an urban teaching hospital. Health Affairs 2014; 33(5): 778-785. Kansagara D et al. Risk prediction models for hospital readmission: a systematic review. Journal of the American Medical Association 2011; 306(15): 1688-98. Minmin M et al. Quality of life and its association with direct medical costs for COPD in urban China. Health & Quality of Life Outcomes 2015; 13(1): 1-6. Muenchberger H, Kendall E. Predictors of preventable hospitalization in chronic disease: priorities for change. Journal of Public Health Policy 2010; 31(2): 150-163. Osborn CY, Harrell F, Kripalani S. Determinants of health after hospital discharge: rationale and design of the Vanderbilt Inpatient Cohort Study (VICS). BMC Health Services Research 2014; 14(1): 1-20. Owens JM, Garbe RA. Effect of enhanced psychosocial assessment on readmission of patients with chronic obstructive pulmonary disease. Social Work in Health Care 2015; 54(3): 234-251. Purdy S. Tackling avoidable hospital admissions: improving or compromising quality? Quality in Primary Care 2012; 20(4): 243-244. Silow-Carroll S et al. Reducing Hospital Readmissions: lessons from top-performing hospitals. The Commonwealth Fund Synthesis Report; 2011. Society of Hospital Medicine. BOOSTing Care Transitions Resource Room. John A. Hartford Foundation Inc; 2008. Van Walraven C et al. Derivation and validation of an index to predict early death or unplanned readmission. Canadian Medical Association Journal 2010; 182(6): 551-557.